John Gregory Brown, born and raised in New Orleans, has raised the bar high for all of those who would write about his native city…and… about epiphany and redemption. His debut novel, Decorations in a Ruined Cemetery, was a stunning achievement in literary craftsmanship and lyrical phrasing. Since then, he has published the critically acclaimed The Wrecked, Blessed Body of Shelton Lafleur and Audubon’s Watch. His new novel, A Thousand Miles from Nowhere, is scheduled for release June, 2016 by Lee Boudreaux Books, an imprint of Little Brown. Once again, Brown has hit a literary fiction home run. 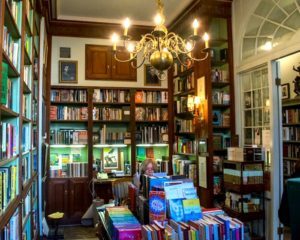 The book has it all—all that a dedicated reader of good literature can hope for when selecting fiction. In the tradition of such southern-born masters as William Faulkner, Walker Percy, Flannery O’Conner, and John Kennedy Toole, Brown has produced a tragicomic tour de force about one man’s search for faith, love, meaning, and redemption. The man in question, Henry Garrett, is the quintessential southern closet case who refuses to stay in the closet, who is allowed by ever tolerant New Orleanians to adopt a pretence of normalcy. Henry marries a woman he loves—a woman who is driven to travel the world seeking the delicacies of cuisine embraced by various cultures and write books about her discoveries. Garrett all the while is driven to quiet the constant “clatter” in his head, a “clatter” which causes him to abandon his respectable position teaching in the very best public high school of New Orleans, squander his modest inheritance on a dilapidated former Magazine Street grocery store and move into it, leaving the wife he loves behind. Others on the edge of madness find refuge there as well. Garrett flees New Orleans post Katrina and winds up in an Indian-owned motel in a Blue Ridge valley town. Hoping for peaceful solitude and time to tone down the “clatter,” he immediately finds himself at the heart of an accidental killing and the voices in his head grow louder and louder. The kindness with which he is greeted at every turn sets him on the road back to recovery from despair, recovery of a purpose, recovery of love. John Gregory Brown’s honors include a Lyndhurst Prize, the Lillian Smith Award, the John Steinbeck Award, a Howard Foundation fellowship, and the Louisiana Endowment for the Humanities Book of the Year Award. 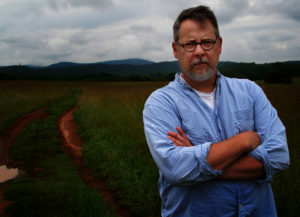 He is the Julia Jackson Nichols Professor of English at Sweet Briar College in Virginia, where he lives with his wife, the novelist Carrie Brown. A soulful musing on art, love, and sanity, and on art’s power to redeem. A beautiful, haunting novel. —Tom Franklin, novelist and short fiction writer, author of Poachers and other works. John Gregory Brown is a writer I have long admired, and A Thousand Miles From Nowhere is his best book yet, a marvelous depiction of one man’s stumbling journey from despair toward a hard-won redemption. —Ron Rash, novelist and short fiction master, author of Serena and other works. Natural disaster combines with accident to make a wreckage of a life. Now, in the sympathetic hands of the long-absent Brown (Audubon’s Watch, 2001, etc. ), it’s up to the protagonist to pick up the pieces. Henry Garrett has been on the run, headlong, for days, fleeing New Orleans and the terror of Hurricane Katrina. Now, down in the quiet shadow of the Blue Ridge Mountains of Virginia, he rolls to an uncertain stop smack in the middle of the life of a “short, round Indian woman,” her glittery fingernails disguising a badly broken heart. Latangi takes him in without hesitation, knowing only that he has been driven from a home that may no longer exist—and certainly not knowing that the 41-year-old was “deep down, still just a dopey adolescent kid” when it comes to matters of the heart and deeply troubled when it comes to matters of the mind. Indeed, one of the things that Henry is running from is the possibility of inherited madness (“undone,” in the polite parlance of the South). But what has become of his wife and other loved ones? What is there to run toward? Henry is working on sorting all that out even as he accidentally kills an old prisoner working on a road crew, his arms raised “as if what he meant to do…was fly.” Putting an already unhinged fellow under additional stress is never a recipe for happiness, but Henry struggles to work it out, finding comfort in the sometimes-eccentric but deeply hospitable people of Amherst County. Henry yearns not for having “his mind set right” but for resumption, the ability to pick up his dreams where they left off, make peace with family, and get on with life. Thanks to the resourceful, gentle Latangi, who has troubles of her own, he gets there. Brown’s ambition and achievement in Audubon’s Watch lie in the sensual effects of his ornate, overripe language. Again and again, he pushes his style to the limit, with more than a nod to the stagey conventions of the (Audubon’s) day. It’s a brazen performance that few authors would have the skill or the courage to risk. —New York Times Book Review. present and future become joined, indistinguishable one from the other. …a staggering achievement, John Gregory Brown’s complex portrait of a man painted in prose of stark beauty…Brown is an astonishing writer; disturbing, odd, but mindful always of the importance of narrative, his ample skills evident in this curious, heartbreaking — and deceptively simple — story of a man broken and bent but not beaten. In John Gregory Brown’s beautiful second novel is a warm assent to the power of acceptance and healing. The Wrecked, Blessed Body of Shelton Lafleur not only endorses the healing faculty of art, but the capacity of ordinary people to transform their lives into joyous celebrations. This novel is John Gregory Brown’s gift of grace to us. The story is a moving one, and sorrowful because so ordinary and so familiar…The refreshing thing about the book, in addition to the timelessness of the situation the characters find themselves in, is that implicit in their struggle is the assumption that all the effort is worth it, that there are such absolutes as right and wrong, and that locating oneself in this common grid of guilt and forgiveness is incumbent, part and parcel, of finding out who you are.